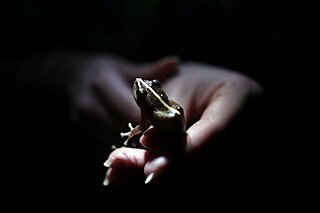 Scientists report that many types of amphibians, especially frogs, are in a steep global decline likely caused by a mix of habitat loss, climate change, pollution and a virulent fungus. Thanks Cal, This picture makes sense with the Title of the post. Human ugly hands holding the fate of a frog (amphibian) and so many other creatures who simply want to live on this planet in their own ecosystems. Unpolluted by the chemicals, poisons and incredible destructions created by us in such a very short geological time frame. Climate change is a natural planetary cycle and is also destructive, but nothing like we humans, our over reproduction and consumptions. Unless you count asteroid collisions. Frogs are getting scarce, I hardly ever hear them anymore. What are we doing to our planet? Everything is vanishing except for humans pity!